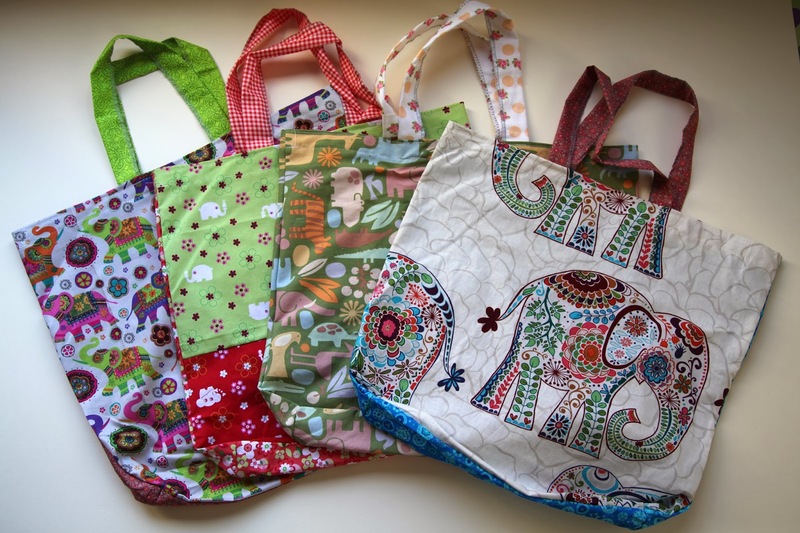 Green Bag Lady: I Want an Elephant FREEBIE! I Want an Elephant FREEBIE! So, I asked Santa for an elephant for Christmas and he said even a baby one was too big for the sleigh. Sigh. I have a whole Pinterest board dedicated to these guys. I'm also not sure that an elephant would like our chilly Colorado weather. Hmmmm. Ah well, I guess it means that I should celebrate how awesome elephants are by giving you a chance to win a great bag. Sound good? 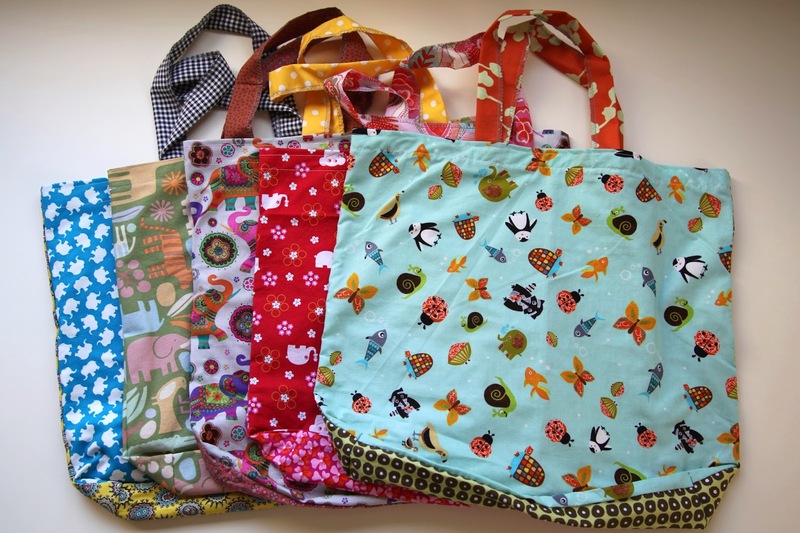 How about winning one of nine bags made lovingly with elephant fabric? We will randomly pick 9 lucky people to win an elephant shopping bag. Oh, love the one with the hippos on it. I get my aunt a hippo every year for Christmas. One year she sang the song and said she wanted one, the rest is history! I used your online pattern to make bags as Christmas gifts, but I would still *love* to win an elephant bag from Green Bag Lady to gift to my oldest school friend Tracy, who *LOVES* elephants! I love to get one, so pretty! Love your bags! Elephants forever! This pattern theme is my favorite so far, but they are all so wonderful! These elephant bags are so cute, especially the green one with the other animals. Looks like a safari! Too cute!!! I want to get a bag with elephants! I prefer Indian ones! I have a dear friend who loves elephants- what a perfect bag this would be for her. thanks for the chance to win one of your lovely bags. Elephants are such good luck. What great elephant prints:)Thanks for the chance to win! would love to win one of your real bags! looking to use my scraps up following your example! love your website! Awesome! Success and prosperity in the New Year! Great idea-these wonderful bags! Drawing again, maybe I'm lucky? Really want this bag! Great idea-these wonderful bags! Bag with an elephant that's cool! I believe that I will be a bag with an elephant! LOVE love love the elephant bags! Your team makes totebags fun and beautiful. Thank you for yet another lovely contest. very cool, I like elephants! this Indian style! I hope to win one of them! Thanks so much for another fantastic giveaway! Great bags, elephants is wonderful! I love the first one on the bottom picture with the large elephants, so lovely! I would love to win one, they're so lovely! What a wonderful idea! Beautiful and bright print! I really want this bag! Ellies are the best! And my Bestie collects them. I would love to give one a home with her! thanks! Very nice bags and charming elephant! Wonderful elephant bags. My grandsons love the elephants at the zoo and my mom collects elephants. It would be a real treat to win an elephant bag. I'm a real user of cloth bags, always. Thanks for the giveaway. I have 2 already and use them all the time. OhMy I would love to live with an elephant too! Santa didn't deliver any, but maybe he did via you! hee hee Love your bags and all your doing. I gave away a lot of reusable bags on the east coast as I just moved west where an elephant could really aid in carrying all sorts of treasures around. I Love Elephants! I love Your Bags! How cute are these? I´d love to have an elephant for 2014. Thanks for the chance. I adore your bags, and I think elephants rock. Elephant bags are so cute, especially the light blue one with small elephants, butterflies and penguins. I Want an Elephant FREEBIE! Soo much! It's my favorite animal. And these bags are colorful and exciting.I love it!!! Teresa! Happy New year! We in Russia are preparing for the new 2014 year and 7th of January we will celebrate Christmas. But that's not all the new year holidays: January 14 - the old new year (new year on old style). Elephants are beautiful! Oh the first one with the elephants and penguins on it would be perfect for my daughter. She too loves elephants but penguins are her number one. Thanks for the chance. these are wonderful, I have so much fun using your bags. I get comments and direct them your way. Thanks for a chance. So cute elephants.Happy New Year! Elephants are wonderful! I love these!! Hi I make GBL bags for friends & family in Belfast, Northern Ireland (we've had a plastic bag tax here since April) - I'm in the middle of a Hello Kitty one right now! An elephant bag would make the perfect gift for my little sister! Thank you for the give away. Happy New Year!! Gorgeous bags as usual, Teresa! Hello :) I wish health and happiness to you and your family. Warmth and smiles in the year of the horse! Happy New Year! Great bag. Good luck to everyone! Wow! Is that a Valori Wells elephant? Gorgeous! !